Detained Marcos Mayor Jessie Ermitanio's lawyer Jason Perrera. 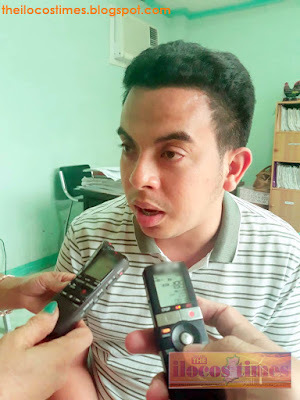 Laoag City—Bernie Lazo, also known as Alex Vergara, star witness in the murder case of the late Marcos Mayor Arsenio Agustin has recanted his statement, Atty. Jason Bader Ll. Perera said. Mr. Lazo’s statement implicated detained Marcos Mayor Jessie Ermitanio. Mr. Perera is Mr. Ermitanio’s lawyer. Perera said the arresting officers allegedly intimidated the witness to make a statement against Mr. Ermitanio. He added that the witness is ready to present an affidavit recanting his previous statement in court. The lawyer also said that they were able to establish that Mr. Ermitanio does not own the nipa hut where a raid on resulted in the seizure of unlicensed firearms and explosives. “The hut is owned by the Department of Environment and Natural Resources (DENR) and not mayor Jessie… We are confident that the name of Mayor Jessie will be cleared. We are hoping against all odds after several hearings of motions, it will be on our own favor,” added Mr. Perera. Police charged Mr. Ermitanio for the alleged killing of his predecessor, Mr. Agustin, on June 3, 2017. Mr. Ermitanio was formerly the Marcos vice mayor and had succeeded Mr. Agustin, after his death at Brgy. Mabuti in Marcos, Ilocos Norte where he was inspecting a water impounding dam project. Mr. Lazo will reportedly present his on the upcoming pre-trial at the Marcos Hall of Justice.